This film marks a high water mark in Hammer’s history, and the five-minute graveyard sequence – part reality, part nightmare – is justly considered to be one of the most frightening in the British cinema. 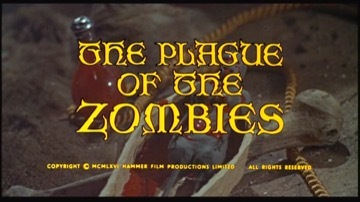 Jacqueline Pearce’s characters at Hammer did not have a good time and no sooner had she been ‘zombiefied’ and beheaded in this film, she was promptly doomed to become “The Reptile”. Perhaps she should have taken the advice of the title of the Carry On film “Don’t Lose Your Head”, in which she appeared in 1967! More recently, she gained a cult following for her role as Servalan in the BBC TV sci-fi series “Blake’s 7”.Diane Clare was no newcomer to scary films, having also had parts in Robert Wise’s “The Haunting” (1963) and Don Sharp’s “Witchcraft” (1964).